If you know me, then you'll know that I have another disease far more serious than my Coeliac Disease - namely Landroveritus. I believe it's contagious, so I recommend you keep your distance unless you have very deep pockets, like getting cold, wet and oily, love getting muddy and don't mind travelling very slowly! 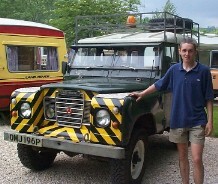 My first Land-Rover, bought in July 1998 was a petrol engined 1976 Series 3 88" wheelbase model which I was very fond of. I christened her Lucy-Jo ('cos everything was either seized up solid with rust or had worked loose (Lucy - geddit?) and she was James's Offroader (J.O.).). In the spring of 2002 I fulfilled an ambition I had had for a very long time by taking her on an overland expedition. Along with a group of friends in their various Land-Rovers, I drove her to Morocco to the Sahara desert and back again. The whole trip was very exciting and not entirely without incident. You can read the diary or look at some of the photographs. 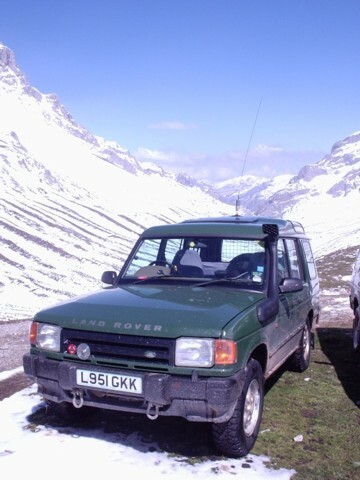 Shortly after my return from Morocco, I decided to sell her as I wanted to move up to a faster, more economical and modern Land-Rover, so in August 2002 I replaced Lucy-Jo with a 1994 Land-Rover Discovery 300 Tdi S.
My Discovery (christened Katie, just 'cos it's a nice name) served me well for a few years. She was worked hard off-roading, pulling various trailers and taking me on an off-roading holiday in the snowy Picos de Europa mountains in Northern Spain. After a few years cruising around in the relative luxury of my Discovery, I forgot how uncomfortable, slow and unrefined old Series Land-Rovers were. I also began to miss the character and simplicity of the old workhorses. As I live in suburbia and use the train to get to work I don't need a totally reliable daily car, so I decided to sell Katie and get another old Series Land-Rover. The plan was to get a Series 2 or a Series 3 109", but I was fortunate to come across a gorgeous Series 1 88" for sale at the right price in the right place. So in October 2005 I bought my third Land-Rover, Huffo (named thus because the letters of her registration number are HFO). Once I had built trust in Huffo to be reliable enough to be my only vehicle I sold Katie. As if simply keeping a 50 year old Land-Rover running wasn't enough, I decided that a fun challenge would be to drive Huffo to John O'Groats and Land's End (the two points on the United Kingdom mainland that are futhest apart). This adventure wasn't entirely without incident: an abridged version of my diary of the trip was published over two editions of Land-Rover Monthly (LRM) in July and August 2006. You can read the full version here. In August 2006 a friend decided it was time to get rid of his long term restoration project: a 6cyl Series 3 109" he had christened Gnu. He struggled to sell it, so eventually I ended up being it's proud owner. Once I had taken delivery I crawled all over the vehicle and found that there wasn't actually very much that needed doing to get Gnu back on the road. I rebuilt the front swivels, painted the chassis, removed the faulty free-wheeling hubs and gave her a much needed cosmetic paint job. Gnu passed her MoT first time with no problems. I used her for a few months, but then decided that running two old Land-Rovers was too much effort and expense, so Gnu had to go. A friend of mine who lives not far away wanted a big open top Land-Rover, so after a bit of negotiation I got a second hand hood which I fitted to Gnu - at which point my friend couldn't resist her and bought her off me! I still see Gnu and occassionally get to drive and maintain her. Through the ownership of my various Land-Rovers I have learnt a lot about car maintenance, modifications, Land-Rover history, and driving on and off-road. As a long term member of number of Land-Rover clubs and internet forums and newsgroups I find that the same questions come around time and again. I have put a small amount of information here on my website to helpfully point out to people who ask questions about things I know the answers too. I hope you can find some things here that interest or that amuse you. You will find pictures of the inside, outside, oily bits and shiney bits of all my Land-Rovers past and present, along with various Land-Rovers belonging to friends and enemies here along with photographs of various of my other hobbies and social life. 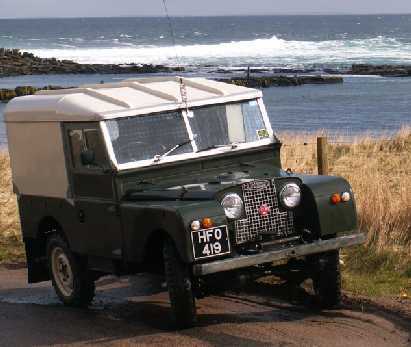 If you want to find out a little about the history of a Land-Rover you own, you can write to Eric Pagan at Land Rover Traceability. When I wrote to him about Lucy-Jo, I received a letter back that told me that Land-Rover chassis (VIN) 90125797 was built at Solihul by Land Rover Ltd on or about 20 February 1976. Their records also show that the vehicle was painted in Bronze Green colour, and was dispatched to Dunham & Haines, Luton on 23 February 1976. I found that the registered keeper of any vehicle can obtain any details the DVLA have about previous owners of their vehicle by writing to the address below enclosing a cheque or postal order for £5 per vehicle made payable to "DVLA, Swansea".